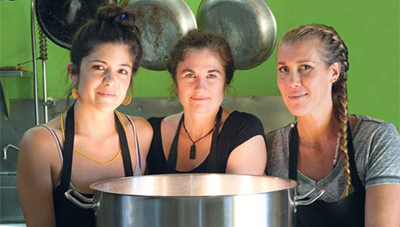 Kitchen Witch was started from the love in three women's hearts, an idea for societal impact, and a passion for food. Each woman wanted to provide a service of deep nourishment to her community, and be able to pour her heart into what she did every day. With that, Kitchen Witch was formed in Santa Cruz County in 2014. Kitchen Witch stems from a collective background in Traditional Chinese Medicine. Two founders, Magali Brecke LAc. and Rhiannon Henry LAc. were already making broth on their own for their immediate community members, and founder Missy Woolstenhlume brought the administrative experience to the table. Together, their individual lights shine even more brightly. You can feel and taste that light, passion and dedication in each and every jar of broth they make. Kitchen Witch is dedicated to changing the way people eat, bringing awareness to the health of people and our planet, and building a foundational resource upon which our community can thrive. Kitchen Witch is committed to quality beyond the standard of any other broth maker. They are certified organic by CCOF and have personal relationships with the local farms and ranches where they source their bones. Their broth is packaged in glass jars to reduce waist and exposure to toxins in many plastics. Kitchen Witch is also a member of the Plastic Pollution Collation, a global movement to reduce plastic waste in our oceans. Plastic packaging is a major contributor to the destruction of our planet, and the founders are committed to building a company that is not part of the problem, but part of the global economical solution. Kitchen Witch's products are certified organic by CCOF and the team is completely dedicated to using the finest ingredients on the market. Their sourcing includes organic vegetables, organic cage-free Mary's chicken, pasture-raised and grass-fed Panorama beef, locally farmed Fogline pork and top of the line BN Heritage turkeys. The owners know the farmers and suppliers personally, have traveled to the farms, stuck their noses in the dirt and walked through the processing facilities to ensure that the sourcing for their final product is in compliance with the standards they hold for ethical treatment of animals and ecologically sound farming practices.